What is UW Libraries Search and how do I use it to find resources? Does the library have my textbook? Who has access to resources from off-campus? How do I find full-text scholarly articles in my subject? How do I find e-books? How do I limit searches to UW Libraries locations? How do I cite a source using a specific style? How do I find an article by citation? How do I renew books and other loans? Do I have access to this journal? How do I request a book/article we don't have? How do I request materials using Interlibrary Loan? How do I connect Google Scholar with UW Libraries? 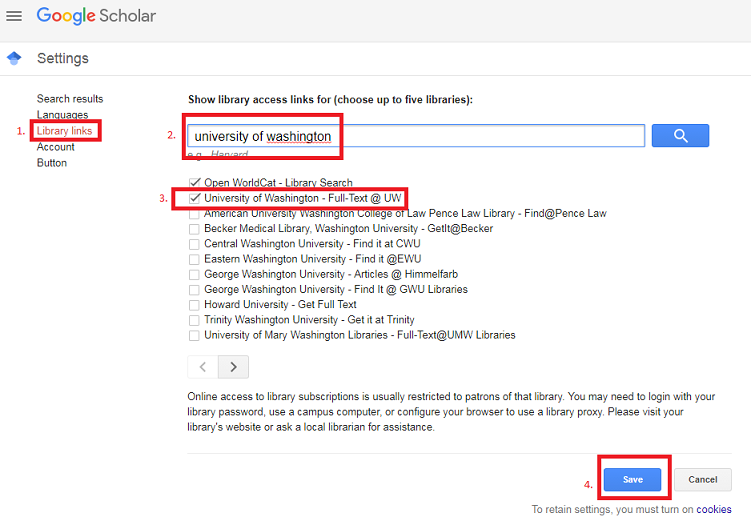 FAQ: How do I connect Google Scholar with UW Libraries? Google Scholar can be easily configured to tell you which search results can be accessed through UW Libraries, and provide a direct link to the resource in the catalog for online access or to request it. 1. From the Google Scholar homepage, click the three strips on the left side of the page. 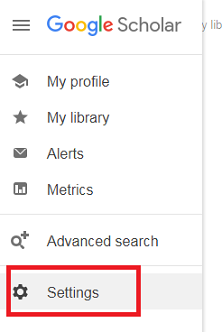 Tip: Click Sign In at the top right to save this to your UW or other Google account. When your account name is displayed, this library access link will be connected to it. 3. Search for "University of Washington" to reveal the access link University of Washington - Full Text @ UW. Check the box next to this option, then click Save. Tip: If you don't see the "University of Washington - Full-Text @ UW" link on the first page of results, click the ">" icon to see more results. 4. Select Full-Text @ UW next to a search result to view online access and request options from UW Libraries. << Previous: How do I request materials using Interlibrary Loan?